Go ahead and laugh, but these folks are nothing if not sincere. I told you this was a company town. They cheer without irony. 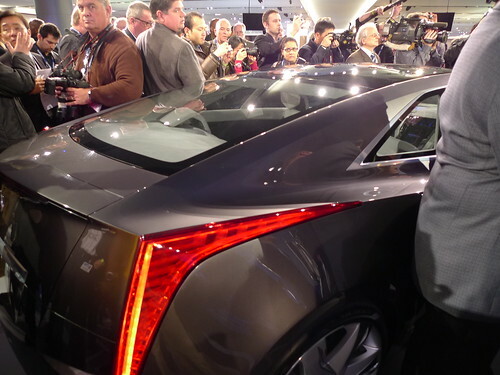 Jalopnik got a wider shot as it came down the runway. That’s Bob Lutz in the passenger seat. You don’t know whether to drive it or pat its wee head. Off to stake out a seat at Chrysler, and see how their sackcloth-and-ashes act will play. The pitch for the Converj: Batmobile meets Prius & mates. I like the look of the “Converj”. It’s built on the Volt platform. 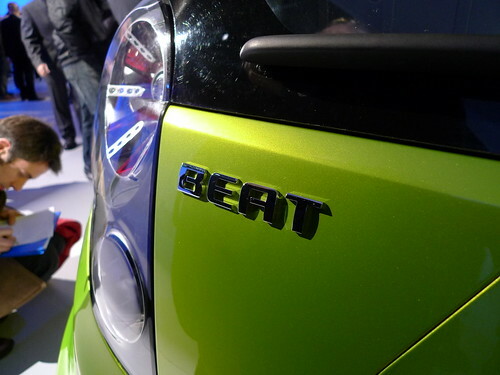 Why do car makers insist on using Ebonics when they name their cars? Ebonics is so ’90s. A friend and myself have had a long running joke about car makers getting their model names from a consultant called “The Department of Stupid Names Department”. I’ve long thought that a high MPG small gas powered car is a great alternative. The Europeans and Asians have been building them for years. I once rented a two cylinder, 600cc Subaru in Europe. It was perfectly acceptable in town. Not so much on the road. Go to ebay and look at the prices for Fiat 500s. that’s the Department of Redundancy Department. Disappointed in the Subaru Legacy – no character. Even the ugly Subarus, and there are a lot of ’em, have some individuality, some appeal – not this thing, looks like any other mid-size Japanese sedan. Catherine • MichaelG • Deborah • basset • and YOU.